October is finally here and for Michiganders this is a thrilling time for two big reasons. Not only is it the beginning of fall and the beautiful transition in the nature around us, but October is also the beginning of the Red Wings hockey season. After a long summer, Michigan hockey fans can’t wait to be back in Detroit watching their favorite team. The Detroit Red Wings are beloved in Michigan for countless reasons, but one innate link to why Michigan is so devoted to this team is because of their legacy with the National Hockey League (NHL) and their consistency as a successful team. Whether the Detroit Tigers’ season is a bust or we’re sick of watching the Detroit Lions lose, we can always count on the Detroit Red Wings to revive our hope in winning. Grand Rapids is a hotspot for Michigan hockey. The Grand Rapids Griffins are the American Hockey League (AHL) affiliate to the Detroit Red Wings. Essentially, this is the middle man between junior leagues and the NHL. Although the Red Wings control their roster, it’s up to the Griffin’s to prepare young prospects for their move up to the NHL and hopefully join the team of hockey legends. 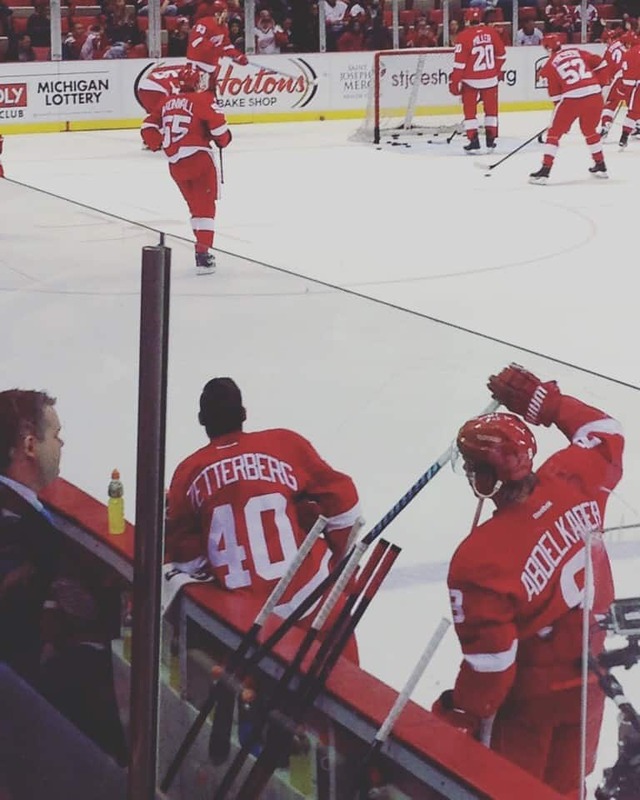 Within the last few years, the Grand Rapids Griffins have turned out superstars such as: Joakim Andersson, Danny DeKeyser, Tomas Jurco, Petr Mrazek, Gustav Nyquist, Riley Sheahan, and Tomas Tatar who all currently play in the NHL with the Red Wings. In 2013, the Griffins also brought home the Calder Cup Trophy, which is the equivalent to the Stanley Cup Trophy in the AHL. September in Traverse City becomes a mecca for Michigan hockey lovers. Fans, scouts, coaches, and players from junior leagues, the AHL, and the NHL gather to participate in pre-season hockey games. This time of year means Centre Ice Arena is flooded with fans hoping to discover an intriguing new prospect or witness their favorite Red Wings’ superstar begin their latest hockey season. This place has become so well known by Michigan hockey lovers it’s now fondly referred to as “Hockeytown North”. The test of a true hockey fan is whether or not they can recite the “original 6” off the top of their head. The “original 6” refers to the first six hockey teams that formed the NHL. The NHL is the highest ranking professional ice hockey league in North America. The league now consists of 30 teams, 23 from the U.S and 7 from Canada. The vast majority of teams that now make up the NHL must always pay homage to the original godfathers of the league: the Boston Bruins, Chicago Blackhawks, Detroit Red Wings, Montreal Canadiens, New York Rangers, and the Toronto Maple Leafs. The Red Wings will always have deep rosters that include once-in-a-lifetime players and coaches which will continue to prove why they are the model team in the NHL. This list includes individuals such as: Gordie Howe, Red Kelly, Sid Abel, Ted Lindsay, Sergei Fedorov, Steve Yzerman, Nicklas Lidstrom, Kris Draper, Chris Chelios, and many more. The Red Wings have had some of the most influential players in history. For instance, Gordie Howe and Steve Yzerman are both argued to be the best players the Red Wings ever had and the best players in the history of the NHL. Each are highly regarded for their impressive scoring records, intelligence, physical strength, and their unselfishness that led them to have notable longevity in their careers. There always seem to be exciting players to watch out for with the Red Wings and this season it’s Petr Mrazek and Teemu Pulkkinen. All eyes will be on the Red Wings’ goaltenders in anticipation to see who will clinch the top spot. Petr Mrazek is looking to be the starting goaltender for his first NHL season with the Red Wings, a position he won from goaltender Jimmy Howard at the end of last season. Teemu Pulkkinen will also be starting his first NHL season as a Left Wing for the Red Wings. His impressively wicked slapshot and lead in goal scoring had him dominating the AHL for the last two years and got him called up to the NHL last season. Recently, the Red Wings’ roster is plush with very uniquely interesting and entertaining players which include Henrik “Zetterbeard” Zetterberg, Pavel “The Magic Man” Datsyuk, Gustav “The Goose is Loose” Nyquist, Tomas “Tatar Sauce” Tatar, and Niklas Kronwall who’s known for delivering destructive hits known as being “Kronwalled”. Besides their iconic nicknames, each of these players are hilarious. Whether they’re pranking their fellow teammates, joking around in interviews, or posting hysterical content to social media they all bring a great deal of comedy and optimism to the team. As the unofficial anthem of Detroit, Journey’s “Don’t Stop Believin'” is a staple at the Joe Louis Arena. This well known tune can be heard ringing out from the speakers and shouted by undying fans when the Wings are winning a game or in the playoffs. The Red Wings have won an incredible 11 Stanley Cup Championships. The Stanley Cup is the highest honor bestowed in the NHL. Comparatively, only two other teams, the Montreal Canadiens and Toronto Maple Leafs, have won more Stanley Cups in the history of the NHL. Staked in rich traditions, but stacked in prideful wins, any other NHL team should be envious. 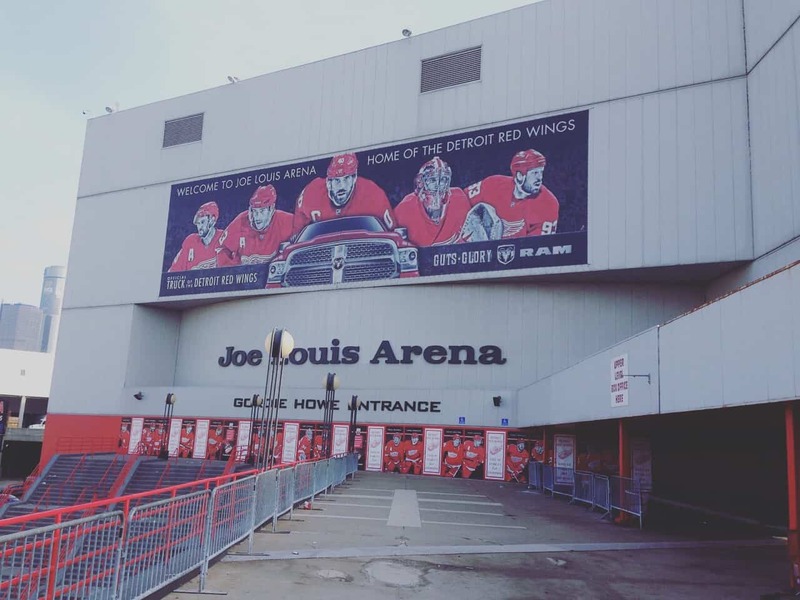 For the past 36 years “The Joe” has been home to the Red Wings and a fixture in the NHL. It has also been an icon in Detroit and has hosted many other events and entertainers over the last three decades. A new era is upon us with “The Detroit District” expected to open in 2017, which is expected to become the new jewel of the league. However, until that time, the Red Wings will still be rocking it at “The Joe”. This original nickname refers to the city of Detroit or the Red Wings hockey team, and can be used interchangeably. Many other cities have been referred to as “Hockeytown”, but Detroit is the only one to make it their official nickname. The Red Wings have trademarked the phrase when combined with their winged wheel logo, making Detroit the only authentic “Hockeytown”. Probably the most recognizable logo in the NHL, the Red Wings’ winged wheel logo is always ranked high as one of the best logos in all of sports because of its tribute to the origins of Detroit’s motor industry. This year, USA Today ranked the Red Wings’ logo the 5th best in all of American sports. Compared to other teams, the logo’s design has gone untouched for decades because of its’ rich history and popularity. Red Wings fans are EVERYWHERE. Fans across the United States always turn out in droves to support the Red Wings. It’s always a satisfying and prideful moment to recognize Red Wings fans filling the arenas of our most vicious rivals. Whether they are at home or away, the Red Wings always play to a sea of cheering red in the crowd. Probably the oddest but most respected tradition in all of sports is the Red Wings’ throwing of the octopi. This tradition came about during a Red Wings’ Stanley Cup playoff game in the 1950’s. Two brothers, who were local businessmen from Detroit, hurled a huge lifeless octopus onto the ice. The eight-legged creature symbolized the eight games the Red Wings had to win in order to earn the Stanley Cup. From then on, it became a tradition of good luck. Fans will purchase, smuggle in, and throw real octopi onto the ice to show their support in this odd tradition. The Red Wings have embraced this ritual to the point that they even made their mascot a giant purple octopus named Al. The new head coach of the Red Wings is the ultimate Michigan man. He will be the first American and Michigander to ever coach the Red Wings. He’s been a winner ever since his days at Ferris State University. During his coaching career he’s led Western Michigan University into the National Collegiate Athletic Association (NCAA) tournament and guided the Grand Rapids Griffins to a Calder Cup. He’s a great fit following the previous coach, Mike Babcock, because of his previous relationship with numerous Red Wings players and his ability to motivate players to achieve greatness on a daily basis. Although many teams make it into the NHL playoffs for the Stanley Cup, no other team does it like Detroit. The Red Wings maintain the longest active streak in post-season appearances in all of professional sports teams in North America. This year, they’re looking to clench their 25th playoff berth. Tagged Detroit, Detroit Red Wings, hockey, michigan, october.